The research was conducted by MBA & Company in late 2012, and took in to account factors like GDP growth potential, level of employment, maturity of digital recruitment, mobile adoption, social media integration and other factors. I got to discuss this research at length with Evenbase CEO Keith Potts, to understand a little better what this research means from one of the veterans of the industry. A conversation with Potts about anything is always illuminating and enjoyable, and this was no different. I discussed these results with Potts to get his take on what the research means, and what the big surprises were. He cited Mexico being on a par with the UK, the high ranking of Australia and Brazil ranking above China. The thinking behind China was that there is still plenty of uncertainty around the future political situation in China. This was certainly the message I took back from #truSingapore and #truHongKong. By contrast, Mexico is showing stability year on year, and Australia has a huge demand for technical and engineering staff that will fuel growth in digital media, particularly given geographical challenges. Competition is another key consideration, and what is already established in the market. The report cites the example of Japan, which offers great potential, but has a well established and very competitive local market. There are 3 times more employment agencies in Japan than their nearest competitor. When a market is so well established and populated by competitors, better to explore the growing markets which offer more potential and a less developed market. The scarcity of labour is another consideration, along with pay. 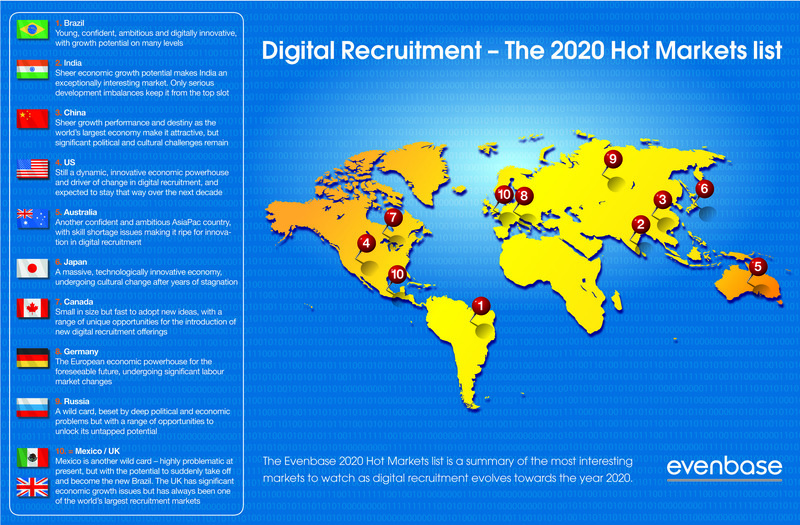 Where jobs are harder to fill, and the salaries are higher, then there is more demand and greater reward for digital recruiting. I was surprised to read that the salary for an executive post in Brazil is double that of the US, which goes some way to explaining the top spot for Brazil. Potts sees the rise in adoption of mobile and mobile apply anywhere being one of the main game changers in digital recruitment over the coming years. The when and where people are looking to use mobile for web search and applications will have a massive impact on the digital products in these countries. The brands that get this right will gain a real competitive advantage, hence the importance of mobile to Evenbase. This is why Evenbase invests so much time and effort in to local partners who really understand what is going on in their own back yard. Potts sees Workana as being one of the rising stars in the group because of the service they offer. Evenbase recently invested in the Argentinian start-up, who are fast becoming the region’s leader in brokering freelance work on-line. Potential clients post work (rather than jobs on the site), and freelancers pitch for the work by presenting their portfolio. Customers can check references on previous work, social recognition, endorsements, etc. through the site, and the more the freelancers work through the platform, the higher their ranking. With more and more jobs converting to work and projects, and the rise in freelancing and working from home, this platform has the potential to grow quickly, and globally. They are another string to the Evenbase bow. I asked Potts how he felt this shift, and the rise in digital recruiting would impact on recruitment agencies, after all if Evenbase are making it easier to connect employees and employers, and contractors and contracts with contractors without the need for the middleman, then the market potential must be shrinking. Potts was quick to dismiss this, explaining, “We are talking about people not products, and people are incredibly complex. As long as companies need people, agencies have a part to play. Many (though not all) direct hiring organisations are behind the sourcing capability of the agencies, and this means agencies will be around for years to come, even if the market is shrinking”. We share the view though that many agencies will need to work harder on relationships, becoming career managers rather than people placers, but like the job boards, they are a long way from dead yet. I spoke with Potts about how he sees job boards evolving over the coming years. He highlighted the changing pricing models giving the examples of Jobsite.Co.Uk and the US launch of Jobsite.Com. Whilst Jobsite.Co.Uk currently operate a pay per post model, Jobsite.Com utilise scraping technology to post jobs (at no charge) from company career sites, offering job seekers up to 4 times as much relevant content, using social profiles and Evenbase’s semantic matching technology, Jobtology, to offer up only jobs they are qualified for. Customers pay for access to candidates who fit and have expressed an interest in the opportunity, in a pay per performance model. Potts highlighted that it was important to understand these new markets, in order to offer the best digital products for each of them on a local basis. Potts feels semantic matching, and Jobtology in particular, will play a big part in improving candidate experience and quality of response by only offering jobs or candidates that are relevant. I shared the research from the UK #CandE’s that the average response needed to fill a job is 85 applicants, and that an average of 70% of these applicants are unqualified. Only 20% of applicants see anything other than the job ad before they apply, hence the mismatch. Potts pointed out that Jobtology uses social profiles and other data to match potential candidates only to jobs where there is a fit, and this will significantly change these numbers, after all, if applicants don’t see jobs they don’t fit, there is no danger they will apply. This will see a reduction of jobs by e-mail, and other filtered services, with matching and messaging by the most appropriate channel, such as mobile. It will be interesting to see how this evolves. I asked Potts where the aggregators like Indeed and Evenbase own Jobrapido fitted in to this brave new world. His reply was that Vito (Lomele), the Jobrapido founder can take content from any job board in the world and serve it up to. JobRapido have a presence in 55 countries, and are the number one job site in many of these locations. This doesn’t mean that all of these countries will be a priority (hence the research), but it does give Evenbase a foot in the door. Growth in new territories by Jobrapido will come by investment in those countries who are displaying the best potential for GDP growth, a key factor in the research. Given the growth of Jobrapido and competitor Indeed across the globe, i asked Potts how this had impacted on the domestic job boards. My thinking was that there was now only a need to advertise on one board, and the job would go viral via the aggregators. Potts responded that recruiters haven’t caught up with this yet, and that 95% of advertisers go for the job board model. The remaining 5% opt are smarter and go for a joint approach. Whilst any job can, and will end up in the aggregation channels, it is the sponsored ads that get front page listings and promotions. An increasing amount of the aggregator revenue stream is coming from job boards, who recognize the additional traffic and response driven by these platforms. Interestingly, spend on both job boards and aggregators are continuing to increase. What is clear from the Evenbase strategy is that whichever way customer spend goes, and it may switch as more companies look to join the smart 5% who invest in both, they have both options covered. Jobrapido is proving a shrewd acquisition by the group. Away from the job boards and aggregators, Potts highlights the new products that are being developed by Broadbean to support direct sourcing efforts. The first launch will be a universal search tool, that will enable recruiters to search across multiple channels from one place. Whilst they are not ready to share yet, there are a number of new products on the road map that Pott’s feels will make a real difference to recruiters. It will be interesting to see what is coming next, because Potts was clearly excited by the prospect. We concluded the conversation by talking about the last piece of the digital jigsaw, social media and social recruiting. Potts has a clear view of where social meets traditional media. He sees social as the natural partner for digital recruiting. There is the benefit of being able to integrate social profiles in to matching without the need for candidates to submit data, particularly when you consider mobile. Social channels like Facebook, LinkedIn and Twitter give potential candidates the opportunity to become aware of companies through employer branding content. The research places less importance on social media, and the likelihood of job seekers turning to social in their search. I think this is an area that sometimes confuses job seekers. Whilst they may not expect to apply in a social channel, the time spent by users in the channels means they can only be influenced in all of their decision-making by the content they come across whilst browsing. It is a little bit like the mobile questions, where job seekers often rank mobile as not important, not because they don’t want to apply by mobile, technology means it is not really an option at the moment. The result is that it is not a consideration. This will only increase response in other areas of digital media, and open up opportunities for social sourcing through the Broadbean products. After the call, I had the opportunity to reflect on the first conversation I had with Potts when he was announcing the launch of Evenbase, and the thinking behind forming a combined digital media offering across the DMGT brands, and the second conversation after they had acquired Jobrapido. The strategy was to take the brands global, look for new investments and products that strengthened the group, and to be able to develop an offering in all areas of digital media. This was a big plan, but it looks like it is paying off in a relatively short space of time. Having witnessed this close up, the prospect of expansion based on this research is realistic. In Evenbase style they have chosen to share the full research with anyone interested. You can download this on the Evenbase site. I enjoyed my conversation with Keith, as always it was an education. DISCLAIMER: I am an occasional adviser to Evenbase and Broadbean. The Evenbase portfolio includes the flagship job board brands Jobsite and Oilcareers, the leading multi-poster and unified search provider Broadbean, Jobrapido – one of the world’s largest job search aggregators, and recruitment partnerships with brands such as 02 Active and the UK’s National Health Service (NHS). The portfolio spans 55 countries, includes a network of over 60 recruitment sites and employs more than 400 people, with offices in North America, United Kingdom, Netherlands, United Arab Emirates and Australia..